I try not to link Prison Planet but this story was too much and ices the cake of TSA police state stories. The latest case of TSA tyranny to hit the headlines comes in the form of a young mother who was subjected to enhanced groping and then shut inside a screening box for almost an hour by agents after she refused to allow them to put her breast milk through an x-ray device, a legitimate request that is even written into the TSA’s own guidelines. 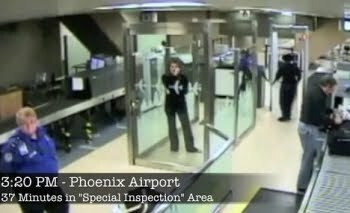 The ordeal, which took place at Phoenix airport earlier this year, was captured on security cameras, which Stacey Armato, who is also a lawyer, gained access to, but only after repeated requests and careful editing by the TSA had taken place. After being told that her breast milk might have to be put through an x-ray scanner, Ms Armato attempted to show the TSA agents a print out of their own guidelines allowing non x-ray screening for breast milk. This act of serious disobedience resulted in the agent pushing Ms Armato into a glass cage, telling her “to be quiet if you know what’s good for you”, while calling for “back up”.